Your chicks have finally come of age and the “henfruit” starts to show up. Now, where do you put it? We are all familiar with the refrigerated case at our local grocery stores. In it, we find the meat, milk, OJ, and eggs (and mingled in there are those whump-out-of-a-can-biscuits and EZ Cheez, but let’s try to forget about those). The eggs are safely ensconced in styrofoam or cardboard containers with a date stamped on the end. They MUST be stored in that carton and MUST be used by the expiration, right? The reason I say that is because they are “factory farm” eggs and you have no idea of the conditions they were laid in or anything about the treatment they’ve had since collection. Most likely, they have been washed, maybe even bleached, to remove the filth and then packaged and shipped to you. They are almost certainly infertile also. Your backyard fresh eggs are something almost entirely different. Your hens likely produced their gifts and left them for you in a clean nesting box. You probably collected them shortly after they were laid and brought them inside. Now you have to decide what to do with them. The less you do to them, the better. It never ceases to amaze me how carefully God planned out the smallest details and how little we understand them. Right before laying an egg, the color is added to the shell surface and then a “bloom”- a protective coating that helps to keep out bacteria etc while preserving the moisture inside the shell. How cool is that!? You want to keep clean nesting boxes so you don’t have to wash the eggs like factory farms do. When you do that, you shorten the fresh “life” of the egg by several days or weeks. Occasionally, a hen has muddy feet or commits an indiscretion in the nesting box. In that case, you want to scrape or rub off the offending material if possible. If that isn’t enough, moisten a cloth with warm water and rub at the spots, trying not to wipe the whole egg. If you scrub hard, you will probably remove the color from the shell. Use eggs that needed cleaning soon. Any that are really dirty should probably be mixed into the dog’s food but NEVER fed to the chickens. Remove any broken eggs immediately from nesting boxes (more on bad habits and other issues at a future time). We pencil a date onto the large end of the egg so we can use them in the order they were laid and to help us keep track of how old the eggs are. It’s not necessary, but handy sometimes (see hard-boiled eggs below). Yes, it is always okay to store eggs in the fridge and that is what we do almost always. Typically, they are stored large end up, but it won’t make much difference if you are using them up pretty quickly. If you read non-farm websites to get information about eggs, they insist eggs MUST be kept in the fridge to be safe and edible. That’s definitely a good rule of thumb, especially with commercial eggs. But it’s not really a do-or-die kind of thing with fresh clean eggs from a healthy bird. The main concern is Salmonella, a cause of food poisoning. When eggs are dirty, laid by unhealthy birds, or have been washed to remove the bloom, the potential for the bacteria to pass into the shell is greater. The egg shell may seem solid, but it is in fact porous and when the protective bloom is removed or cool water is run over the shell, the bacteria can be pulled inside where they have a nice medium to grow in. (Remember, many vaccines are cultured inside eggs). For this reason, if you must wash the eggs, use water warmer than the temperature of the eggs, refrigerate them if possible, and use these eggs first. You may want to mark these eggs in some way to remind you to cook them thoroughly and move them to the front of the line when baking. Having said all of that, we have many times left eggs on the counter for days either because the fridge was full or we were hoping a broody hen would want to set them. Chilling a fertilized egg usually kills the embryo that is suspended in time within. If we ever have a doubt as to whether an egg is still good, we use an easy test. Put the egg in a bowl of water. If it sinks, it’s almost certainly just fine. If it floats, compost it. Just to be sure, always crack the each egg into a separate cup or bowl and examine and/or smell it before adding it to other ingredients. You don’t want to accidentally crack a bad egg into your cake batter, so check first. This is good advice no matter what eggs you use or how old they are. Mother Earth News has an interesting article about an experiment to see how long eggs stayed edible under different conditions. 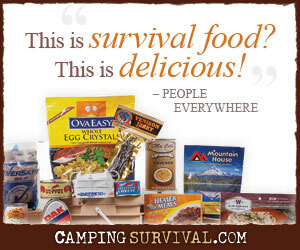 This has applications for the prepper. You can read it here. Have you ever tried to peel the shell off of a hard-boiled egg only to have a terrible time trying to get the white to separate from the shell? You end up with a wasteful mess and mostly yolk to eat. There is a reason for that. Most likely, the egg was too fresh when cooked. As the days pass after being laid, the porous shell allows moisture to evaporate and an air-pocket to form inside. For this reason, I wait until the eggs are a minimum of a week old before trying to hard-boil them. Another way to speed this up is by leaving them at room temperature for a couple of days in advance too. (The formation of this air pocket is what makes an egg eventually float in water when it is too old). As an added help to separating the shell, I make a tiny pinhole in the large end of the egg before cooking to allow the water to get into that space and pull the egg free from the shell. Voila! No more shredded wasted eggs! As I mentioned above, we sometimes mark a carton as “hatching eggs” and put eggs we would like to have a hen set in it. Fertilized eggs stay viable for several days, possibly a week or longer depending on conditions. (This has allowed me to buy eggs from breeders across the country and have them shipped to me). The eggs need to stay room temperature or below, but not be refrigerated. The date on the large end of the egg will help you rotate old ones out. When a hen shows an inclination to broodiness, I place the eggs in a special “brooding coop” I constructed. After dark, I move the broody hen onto the eggs by flashlight and close her in. Almost always, 21 days later we have new fuzzballs peeking their heads out from under her wings. It’s so exciting! In the next installment, I will cover ideas for using your bounty of fresh beautiful eggs. We do not raise our own chickens but always try to purchase organic eggs. They are definitely worth the extra cost! I couldn’t agree more. After having farm fresh, free range eggs, all other eggs literally pale in comparison. Turkey eggs are delicious as well. Very creamy tasting. Soon, our ducks and geese will begin laying. I’m looking forward to trying those eggs as well. How do you tell a fertilized egg vs a non fertilized egg? Nope, not a stupid question at all and not one I’ve addressed. I don’t know of a way to tell fertile from infertile until they’ve been set enough for the embryo to develop. From the standpoint of eating, it doesn’t matter. I would assume that most of the eggs we consume are fertile because we have enough roosters available to see to that. As long as no hen has been allowed to set on them, they are visually indistinguishable when cracked and nutritionally the same. We are basically talking about a cell’s worth of difference. The only ways to ensure infertile eggs are to keep only hens or keep your laying hens cooped without roosters. Thank you so very much for the swift response!